Ok, so I guess I’ll jump on this bandwagon too. Most of ya’ll don’t know me since I haven’t been a phan for very long compared to some. This event was my first phan gather, so you’ll be getting a first-timer’s experiences. I can tell you all my experience of becoming a phan later. It’s a tale of its own, if I say so myself. All you need to know at the moment is that PLV was my first live Phantom show and that I hadn’t seen it since that first time in early ‘07. When I found out it was closing I was shocked and really wanted to go see the show one more time. Unfortunately I had some issues that prevented me from committing early. Thankfully when it became clear that I would be able to attend the closing weekend, some good friends here (you know who you are) gave me the ability to secure some VERY good seats for Saturday and Sunday. 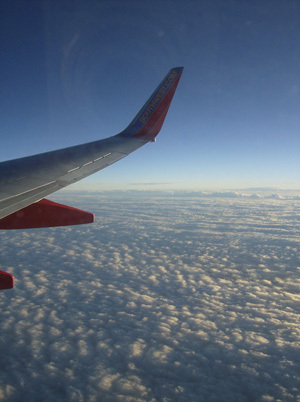 So now I was Vegas bound! Next came the preparing. Even though I was not planning on attending the Friday night show, I was going to get into costume no matter what! Happily my costume was already put together. I’m one of the crazy phans who does the makeup, so the materials for that was all I needed to prepare. Most of the actual work happened the day of costume night. 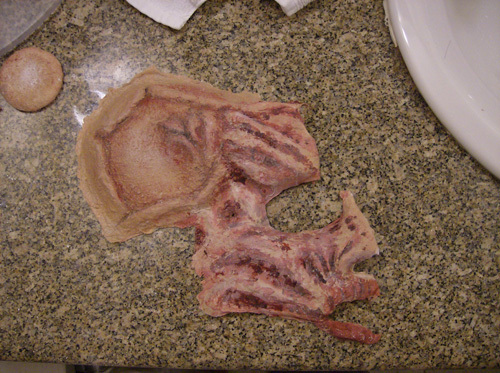 Only bit I made before-hand was the skull crater, which I made separately and packed nice and snug for the trip. I also made a bunch of phan shirts, some to give away, others that were to be picked up by their owners in Vegas, and a few just to have in case anyone wanted to buy one. Ok, now on to the actual trip! Our flight was stupid early. We had a 6 am flight out of Texas. I amazingly got a decent amount of sleep the night before, so I was ok leaving. Heck, I didn’t even really sleep at all on the flight. Thankfully it was straight-shot with no layovers. However the earliness of it means we got into Vegas at around 7 am. Yay time change! 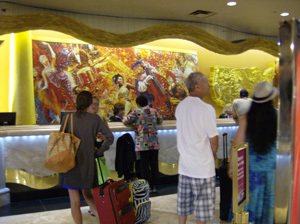 We had arranged airport pick-up with a friend of madamegiry at 8 am, so I wandered around the baggage claim for a bit. Found a Phantom sign. Eventually our ride came, and we heard the bad news: madamegiry would not be coming. Major bummer there. But we soldiered on. The three of us ate breakfast at an ihop before we were dropped off at our home away from home for the weekend: Harrah’s. Due to my makeup plans, we had to get into a room much earlier than the check-in time of 4 pm. Srsly, what is up with the late check-in?? Anyway, that took forever. We finally did get to the room in the Carnival tower. 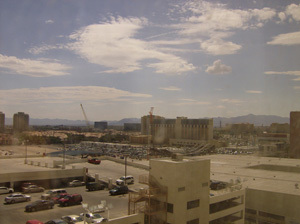 Parking garages and construction yards. Quite charming, really. After unpacking I resolved to take a little siesta before diving into the makeup chair, except, the excitement was already starting to build, so my body said “Sleep? Pffffff- no.” I ended up just laying on the bed for a little while, my mom sleeping like the dead on the other one. Little did I know, this would become a running theme of the weekend. JOY. Somewhere around 1-ish I meet up with Georgia to deliver her shirt. 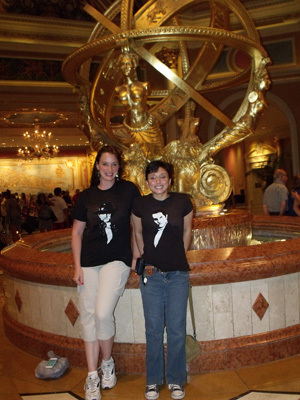 She was the official first phan I met in Vegas. Yay! Then, to business. Somewhere around 1:30 or 2 pm I start the makeup, or rather, my mom does. I needed a bald cap, so she had to put it on and color it for me. She also put on the skull crater and the hair. I had to explain what needed to happen, but she got super into it as we went. I guess we found her inner makeup artist. I did the face bits myself. All told, I think it took about 3-4 hrs to do, some of the time my mom and I working concurrently. If you’re interested in more info about the makeup I can post that in the art board. After that’s done I get into the costume itself and have a dinner of knock-off Slim-Fast. Mmmmmm. Got to love lip prosthetics. I meet up with Georgia again and we geek out over each other’s costumes. She basically forces me into going to the show that night. 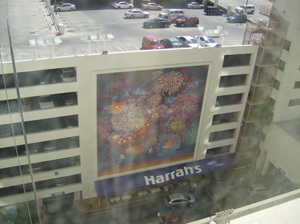 It’s still too early to go to the Venetian at this point, so we plan to meet up in the lobby with the other Harrah’s phans later. I go back to our room and touch up the makeup because the lip was already starting to get loose, darn it. Some things just can’t be helped. Being a punctual person I headed down to the lobby just a little before the assigned time. Naturally I got to wait for the others. The hood protected me from the worst of the stares, although this was likely more due to my not being able to see them, not them not staring at me. Eventually Georgia, her dad, artistkae, and Danielle made it down, and we started off for the Venetian! 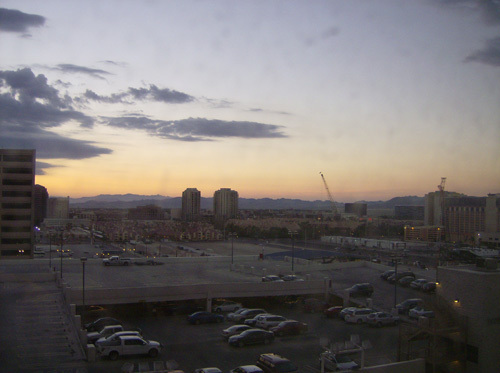 We took the back-way through the parking garages so we could avoid the crowds on the Strip. We had plenty of stares, but thankfully no one stopped us. We end up at the Phantom lobby pretty early, before really any other phans are around. Raphael was there for a little while, and some other phans popped by before getting into costume as well. Some of the actors also stopped on their way in to say hi and look at our costumes. 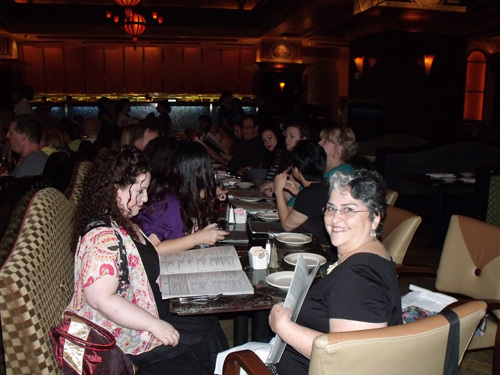 Pretty soon the other phans started trickling in, and many shenanigans ensued. People asked for photos. Some people assumed we were with the company. Fun times. I didn’t get asked as much as others probably because my makeup was just ugly/scary enough to deter normal people from wanting to be seen with me. There were some adorable kids who were dressed up too. At least one parent asked their boy if he wanted a picture with me, but he emphatically shook his head “No.” Too cute. So anyway, soon we all headed into the theater. We had managed to get tickets in the stand-by line. I was actually hoping they were upstairs so I could get one last view from up there, but no, we were orchestra left F! So yay for closeness, but I’m still sad I didn’t get to be upstairs again. Still, F is much closer to the stage than my normal situation in the nose-bleed, so I was excited. Well, maybe excited is the wrong word. By this point I was starting to tank-out on energy, yet strangely still not physically tired. I was just mentally drained, between the early morning, putting on and wearing the makeup, and all the excitement. I wasn’t sleepy, but I found myself just not really engaged with what was happening. Not the best Phantom viewing experience. It was nice sitting on that side, though, because I had never seen any Phantom from that perspective. After the show we hung out in the theater for a little while and then gathered in the lobby for a photo shoot on the stairs. That was great fun, although pretty unorganized. 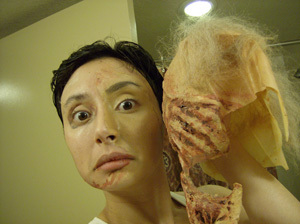 PhantomOfTheSalle and Phantomonabudget: two crazy makeup phans. I was so out of it I didn't even realize what they were doing behind me. If I had known I would have played along. I mostly just wandered about, chatted with some actors who appeared, stood for a few more pics, and then left. I’m kicking myself for leaving earlier than most of the group, because apparently Tony appeared after we left. *sigh* We were just so tired, and I wasn’t really socializing at all, so I called it a night. So we walked back to Harrah’s with Georgia and her dad. I then began the arduous process of removing all that crud. Mom helped me get the bald cap off in one piece. Actually the whole thing just stuck together, the face ripping off like a massive Band-Aide. I set it aside and proceeded to scrub myself raw getting the makeup, spirit gum residue, and teensy bits of latex off me. I felt like I was sunburned after I finished. Fun. I then went to sleep. Or tried to…. Ok, remember the failed nap? Yeah, that happened for regular old nighttime sleep too. I think between the time change, new surroundings, and general excitement in the air I just didn’t sleep. I’m thinking 4, 5 hours TOPS. So what do I do at the wee hours of the morning? I go clean and pack my makeup kit, that’s what. 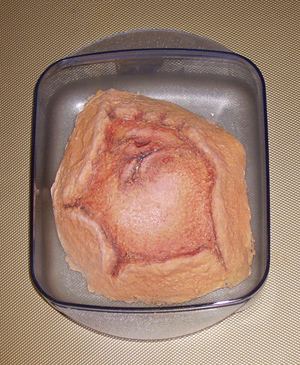 I managed to take the skull crater and face bits off the bald cap, so the cap and crater could conceivably be reused. Since we go to church on Saturdays, we didn’t have any crazy plans for the day. We arranged to have a friend of a friend pick us up and take us to church. However, that wasn’t until 10 am. I basically lay about and read my novel (Temeraire woo!) all morning. I had heard rumors of a trip down to the Vegas sign for a group photo, so I was kind of waiting for a call to meet for that. Unfortunately that didn’t happen. 10 rolls around, and we head down to await the pick-up. We go to church. I fight to stay conscious for the whole service. I even had some coffee before going, which I NEVER do. It didn’t help much. Church ended up being mom’s time to mingle and have lots of fun. She bumped into an old friend that she hadn’t seen since the 70’s in GUAM. AND the church we were in wasn’t the friend’s normal church! Talk about serendipity. 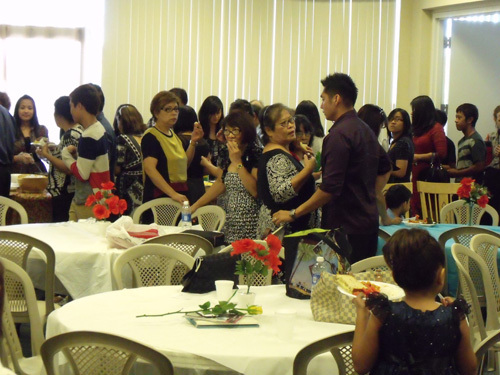 Oh, and it was a Filipino church, so of course there was a potluck. Mmm. Vegetarian foods. At the lunch this one nice lady was inviting us to some show she’s involved in that was playing that weekend, for free no less, but we sadly had to decline. We already had plans. 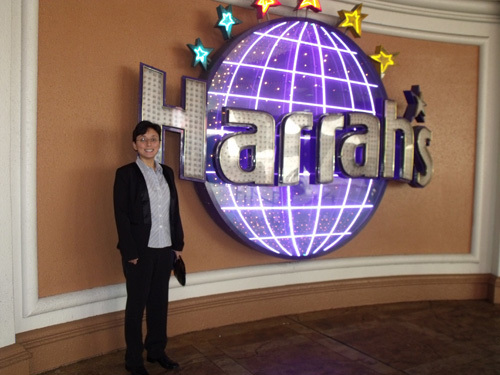 After getting back to Harrah’s I again try to take a nap before the Phan dinner. Of course that didn’t work out. I ended up reading again. Eventually it’s time for the dinner. 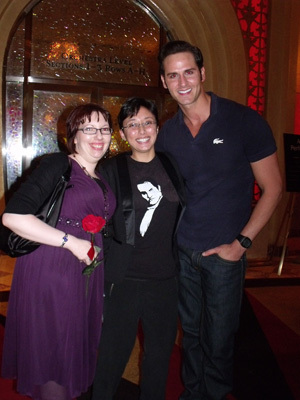 I grab the some shirts I was to deliver at the dinner and head out for the Venetian and the Grande Lux. When I get there I find Loettchen and her sister already waiting. For once I’m not the first person to something. More and more phans start to trickle in. We mingle. Thankfully I am in a much more sociable mood now that my face isn’t encased in goo. I totally understand it when actors say getting into makeup helps them get into character. So true. It’s kind of involuntary, actually. Anyway, main topic with me was my homemade phan shirt. Georgia also happened to be wearing hers, so yay more exposure. 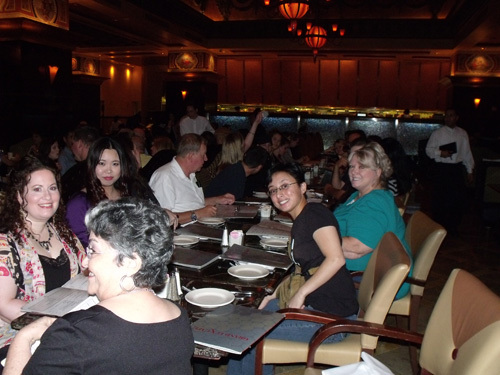 Once everyone showed up we were able to go in and sit at the mega table the restaurant had set up. It was something like four tables put end-to-end. I end up near the end along with Georgia, Vicky, and Alicia, otherwise known as the lucky bunch. We didn’t really start getting food served until past 6 pm, so everyone who was going to the matinee had to basically bolt everything and run. Not us on the end, though. We were going to the 9:30 show. We sat and talked and ate and talked and so forth until well past the departure of the main body of the group. That night was going to be Vicky’s first PLV, so we spent a goodly amount of time getting her excited. After a while we finally decided to head off. Alicia, her mom, and Vicky split to go get ready for the night show, while Georgia, her dad, my mom, and I opted to wander around for a little since we didn’t get to yesterday. 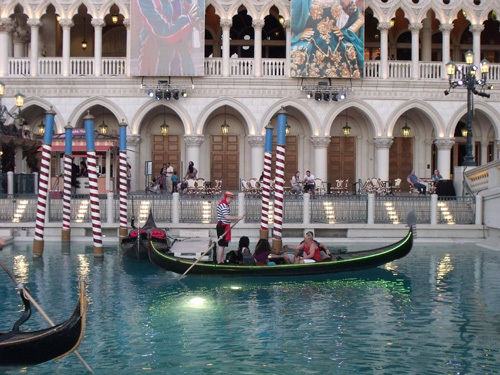 We poked around the Venetian for a bit. They showed us where the elusive Walgreens store was so we could buy some H2O. I don’t know about you guys, but being in Vegas made me SO THIRSTY. Being from Texas, the heat was nothing. It was quite pleasant, actually. Nice dry heat. That dryness really wrecked havoc on me though. I can’t imagine how the singers dealt with it. After suffering thirst in the costume Friday we just had to get some drinking water, so Walgreens was a blessing. 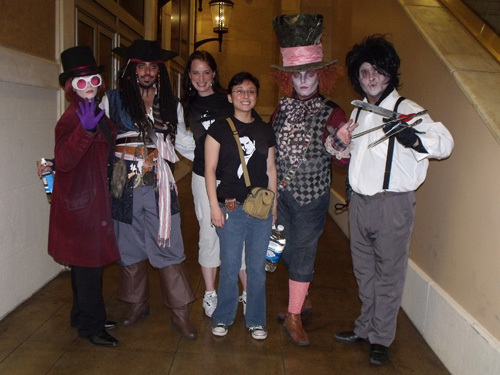 On the way out we bumped into some amazing Johnny Depp character costumers. Unlike us, who costume up for purely insane reasons, these guys did it for tips. I did tip them since the costumes really were fantastic. Nice guys all around. Georgia thought it might have been fun to have done something similar to this with the costumed phans the night before. Who knows. Maybe we might have gotten some money out of it! After that we said goodnight to Georgia and her dad since they were not seeing the show that night and headed back to Harrah’s to prep for the show. I had made a shirt to give to Tony, so I brought that along in the hopes of seeing him afterwards. Off to the Venetian again. 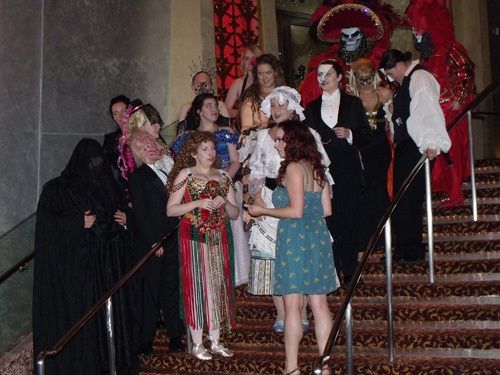 We get to the Phantom lobby around 8:30 or 9 and WHAT A MESS. The place was just jam packed with people. There was a lot of confusion, but from what I gathered the matinee was having problems emptying out the theater, so the lobby was just a writhing sea of humanity, some flowing away and others pressing in. I spent a bit of time standing near this one nice guy. We chatted a little about the show, but then he popped a question that I hear with slight frequency, “Are you Asian?” I explained that this was my mom and she was from the Philippines. Turns out his mom was half Chinese and half Korean while his dad was anglo, so we shared a brief “Hurray for Eurasians!” moment. Eventually the masses of people did start moving into the theater, and we made it inside. We were in the best seats I have ever sat in for any live b’way production. (The couple times I sat front row for local theater do not count.) Right side C on the aisle, closer to the stage than I had ever been before. One row back. ONE ROW. I know a lot of you guys sit up front as often as possible, but not me. Like I said before, I’m a mountaineer when it comes to theater seating. My normal habitat is up in balcony with a set of field glasses, although more recently I’ve been sitting or standing in the very back of orchestra. Perks of being an usher. I’m STILL geeking out about how close we sat, can you tell? The show started a little late due to the earlier confusion, but when it started, I knew. It was LOUD. Lol If I thought it was a little loud Friday night, well, this was a whole different level. I was later told the noise level during overture is to hide the sound of the chandelier moving about, which is understandable. Still, for someone not accustomed to rock concert volumes, it was a lot to deal with. Thankfully the normal volumes of the show are much better, even sitting so close. As for the show, I am happy to report that this time I was in the right mindset to appreciate what was happening. Since I had seen it the night before I spent a good deal of time taking advantage of my amazing view and looked at all the background characters, sets, and costumes instead of focusing on whoever was in the spotlight, with the exception of Kristen, since this was my first and only time seeing her. (Well, I MAY have seen her my first time, but for the life of me I can’t remember.) She really was a gem, and I’m glad I had the chance to see her. I could go on and on about the show, but the short version is that I had much more fun this time around. 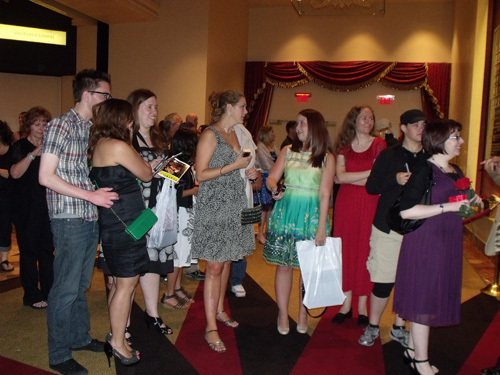 Afterwards I hung around with the others phans in the theater for a short time, then we gradually moved to the lobby to loiter some more. I was still hoping to catch Tony on his way out and give him his gift. Unfortunately I soon found out that he had headed straight home to rest up for the final show, so I had to make other plans for getting it to him. Happily other cast members came up to say hi and chat with us. Masqphan, Andrew, and me. Gah the red eyes. My mom's camera was horrible about that for the entire trip. Eventually we broke up and went back to our rooms. Thankfully this night I didn’t have to spend an hour getting out of costume. Then was again, I attempted to sleep. I've never met him so I don't know his personality, but I did see him walk past me in the lobby before you guys got there. I'm glad you decided to write about your experience, Salle! What I find most fascinating about these reviews is how you'll see them interweave but from different perspectives. 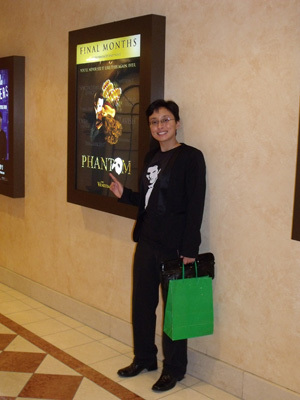 Thanks, PhantomoftheSalle, for sharing your Vegas adventure with us! I esp liked watching those 2 videos of the group of you walking to the Phantom theater at the Venetian -- I kinda felt like I was there walking along with you. Wow, that Phantom theater lobby area just looked so beautiful! And Wow -- those T-shirts you made are amazing! Are you selling any of them still? I think I'd like to get one. ^I believe it was mentioned that it would happen at some point, but I never saw a date/time...I didn't decide I was going until late July, so it was all a bit last minute on my end anyways. I also love your shirt designs PhantomoftheSalle! I'm hoping to get one of Crivello sooner than later. 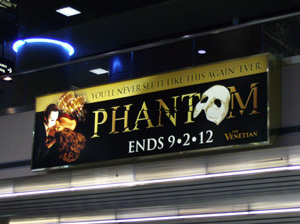 NightRachel wrote: Thanks, PhantomoftheSalle, for sharing your Vegas adventure with us! 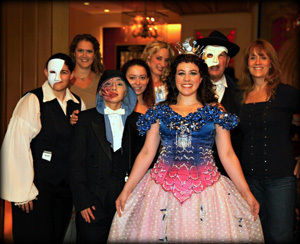 I esp liked watching those 2 videos of the group of you walking to the Phantom theater at the Venetian -- I kinda felt like I was there walking along with you. Wow, that Phantom theater lobby area just looked so beautiful! I do wish I had pulled out the vid cam more. I swear, I'll make a mount or something for it if I go to NYC so I can just set it up and walk around with it. I hat cam would be excellent. It would make up for my low hand-held position! Yes, I am still selling shirts! I have a few of the ones in the photo left over if you're interested in one of those, and I also make them on commission. Click the link in my signature to see all the designs I have available. Yep, I clicked the link in your sig. 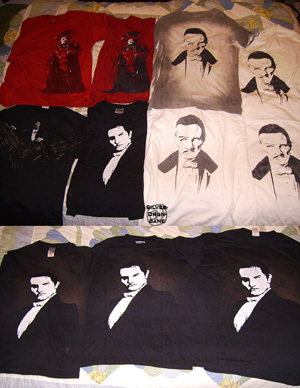 Wow -- you've made so many great Phantom T-shirts! But the one I like the most is the "AC version 2" black shirt. How do I go about ordering one from you? ^That's Ron with me at Fans Week 2009. He and I have met on a couple of occasions and talked makeup, so maybe he thought you were me? Great guy though! I figure if I fail at life I'll email him and see if he'll give me a job. If not, I'll fall back on my circus plan. Phantom on a Budget - No, pretty sure that wasn't the guy. Hair is wrong, also seems Ron is taller than mystery man. Michael Lackey said it probably wasn't him, judging by the story alone. Too bad I never met Ron, but I am so happy he wasn't the creepy man. lol If we both fail at life let's set up an effects shop. NightRachael - I sent you a PM. 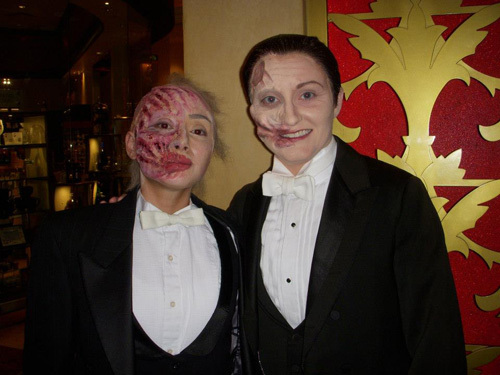 Your deformity makeup was fantastic, and it was SOOO cool to see it alongside Phantom on a Budget's original version. Wish we had more time to talk at costume night, but I think that's what I've said to everybody. So much awesomeness so little time. The t-shirt were awesome too. 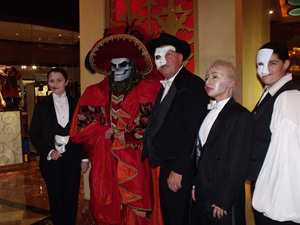 operafantomet wrote: Your deformity makeup was fantastic, and it was SOOO cool to see it alongside Phantom on a Budget's original version. Wish we had more time to talk at costume night, but I think that's what I've said to everybody. So much awesomeness so little time. Thanks. I really wish I spent more time in costume too, but I was so spazzy it's not even funny. Oh, and Saturday is posted.